These are familiar names with top-down management structures like #1 Google and #8 Salesforce. Some “new age” companies like Buffer are following a bottom-up culture like #86 Zappos and its inspiring leader Tony Hsieh. The idea is to create a commune-like setting (in Vegas!) where trust is strong, allowing everyone to reach self-mastery quicker. A non-stop work ethic is part of this core culture but no one should notice it. The belief is that bottom-up management can achieve top down results without enforcing well-defined, on-the-ground actions. Most importantly, this would result in happier employees. Smart employees would simply crowdsource the best ideas, processes and systems. 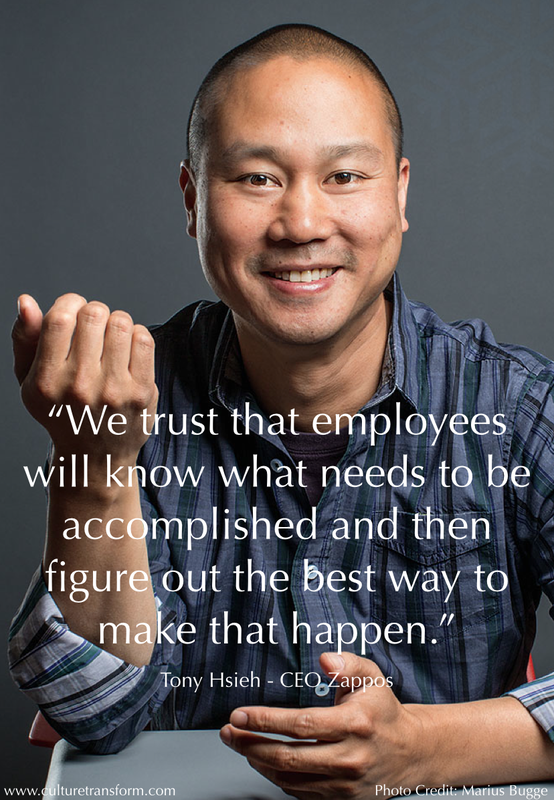 Tony Hsieh and other executives like Reid Hoffman lean towards a form of wisdom training that helps employees leapfrog standard operating procedures in order to “do the right things” from sheer self-awareness. The idea here is that wisdom training is a starter kit for the DIY (do-it-yourself) movement. Job titles are meant to go away. Everyone can call themselves a “CEO” or “servant-leader” if they really know how to manage themselves. The bottom-up management style is not unusual in San Francisco—the epicenter for counter-culture and the “sharing economy.” Unfortunately, what happens with San Francisco startups usually stays here. People say the same thing about Las Vegas. This is why everyone is following Tony Hsieh’s experiment closely. Is Holacracy a new way of re-inventing the world or a passing fad like everything else, which happens in Vegas?